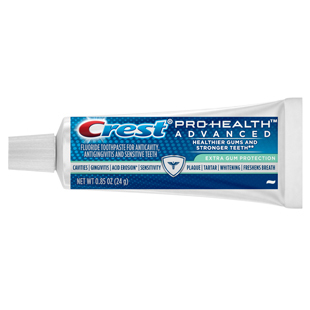 Crest® PRO-HEALTH™ Advanced Extra Gum Protection Toothpaste is formulated with stabilized stannous fluoride to significantly improve gingival health. It has the highest level of antibacterial action provided from Crest PRO-HEALTH Toothpaste. Plus, it is clinically proven to help reverse gingivitis in 4 weeks. Benefits are in these key areas dental professionals check: gingivitis, plaque, sensitivity, acid erosion*, caries, staining, calculus, and halitosis.